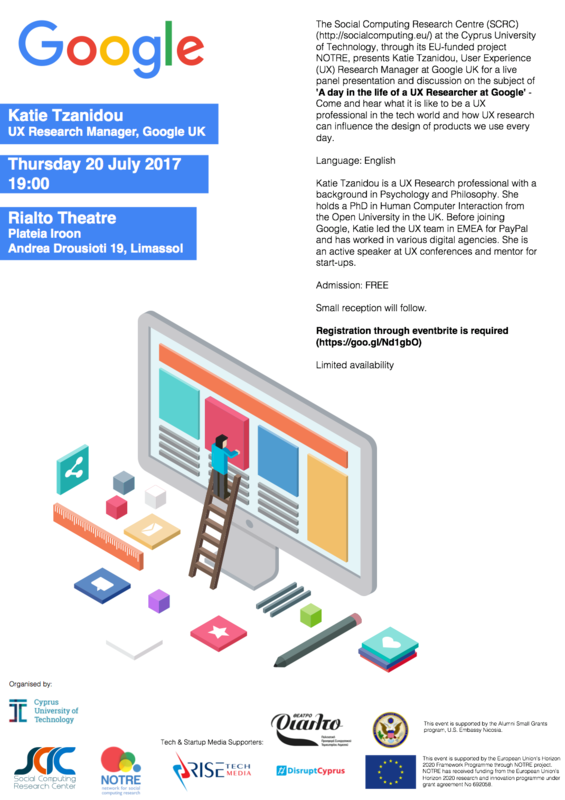 The Social Computing Research Centre (SCRC) (http://socialcomputing.eu) at the Cyprus University of Technology, through its EU-funded project NOTRE, presents Katie Tzanidou, User Experience (UX) Research Manager at Google UK for a live panel presentation and discussion on the subject of “User Experience (UX) at Google”. Katie Tzanidou is a UX Research professional with a background in Psychology and Philosophy. She holds a PhD in Human Computer Interaction from the Open University in the UK. Before joining Google, Katie led the UX team in EMEA for PayPal and has worked in various digital agencies. She is an active speaker at UX conferences and mentor for start-ups. This event is supported by the European Union’s Horizon 2020 Framework Programme through NOTRE project. NOTRE has received funding from the European Union’s Horizon 2020 research and innovation programme under grant agreement No 692058. This event is supported by a Federal Assistance Award (SCY600-16GR-42).